There’s something about the Crystal Coast that stirs the imagination, even inspiring novelist Nicholas Sparks to set two of his best sellers here, in the historic port town of Beaufort (that’s pronounced “Bo-furt” by North Carolinians). Stories unfold all along this 85-mile stretch of Southern Outer Banks coastline, framed by barrier islands and quaint maritime villages. The iconic Cape Lookout lighthouse that watches over the Graveyard of the Atlantic bears witness to thousands of sunken ships, including Blackbeard’s flagship, the Queen Anne’s Revenge. Fort Macon gives testimony to the hard-fought defense of this land. And Shackleford Banks is a place where wild Spanish mustangs have roamed free for 400 years. Even charming Beaufort is steeped in 300 years of historic lore. Today, the Crystal Coast is home to rugged individualists, generations of expert fishermen and boatbuilders, as well as chef-owned eateries that refuse to serve anything but the seafood caught that day from local waters. Commercialism doesn’t dominate the place. And there has to be a good reason that one in three homes is owned by outlanders. Many who visit this part of the eastern seaboard want a piece of the simple, raw, and romantic way of life the Crystal Coast seems to breed. From Western North Carolina, it’s at least a five-hour drive to this southern coast. There are direct flights from Asheville to New Bern, though it’s still an hour’s drive to the beach. Either way, you’ll want a car to enjoy this strand of pristine shoreline. While a handful of small towns dot the Crystal Coast, make your home base in either Emerald Isle or Beaufort, which are a mere 23 miles apart. Emerald Isle offers uncrowded, white sand beaches and an endless array of vacation rentals (www.emeraldislerealty.com), while Beaufort allows for more of a timeless seafaring experience. A charming hamlet of white clapboard houses dating as far back as the late 1600s, Beaufort boasts a handful of historic B&Bs, an excellent maritime museum, and convenient ferry access to Cape Lookout National Seashore and Shackleford Banks. No matter where you unpack your bags, there’s plenty to see and do all along the Crystal Coast. As you might imagine, there are many opportunities for fun in the sun on the Crystal Coast, including surfing, kayaking, or paddleboarding around rugged coastline and estuaries. You can take lessons from seasoned locals, book a tour, or rent equipment through Hotwax Surf Shop, located on Emerald Isle. It’s $65 for two hours of surf instruction, and you’ll be catching waves (or at least making a valiant effort) in no time. (252) 354-6466; www.hotwaxsurf.com. There’s more to do underneath the ocean surface: With more than 2,000 sunken ships, it’s no surprise the Graveyard of the Atlantic is one of the top scuba diving destinations in the United States. From colorful sponges and corals to sand tiger sharks, each wreck is its own ecological microcosm. A plethora of operators offer chartered dive trips, gear rental, and certification courses. Take note: Many of the shipwreck dives require advanced experience, so do your homework. A good place to start is by browsing the operators at www.crystalcoastnc.org. If swimming with the fish isn’t your thing, you can still get a close look at our state’s aquatic life at the North Carolina Aquarium at Pine Knoll Shores. River otters, sharks, a sea turtle nursery, stingrays you can pet, and loads of fish are on display in five galleries that span the mountains to the sea. Nimbus, an albino loggerhead turtle, lives here too. Big and little kids alike will have an educational ball in the hands-on Sea Turtle Rescue Hospital, an exhibit that teaches what it’s like to work with distressed turtles. (252) 247-4003; www.ncaquariums.com. 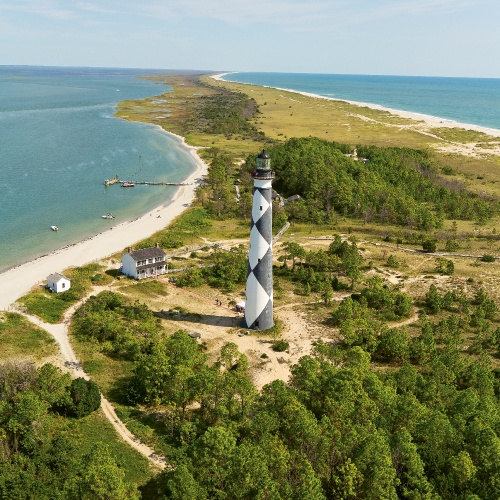 Another nearby attraction is the iconic Cape Lookout Lighthouse, which has warned ships of the dangerous coastal waters since 1859, and is accessible via ferry from Beaufort or Harker’s Island. For $8 from May through September, you can climb the 188 spiraling steps to the top for spectacular views of the coast. Find ferry schedules and lighthouse hours by calling (252) 728-2250, or visit www.nps.gov.